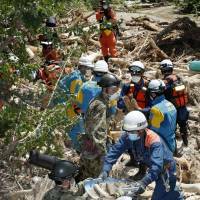 KURASHIKI, OKAYAMA PREF./ OSAKA - Municipal workers struggled Friday to restore water to flood-hit western Japan a week after inundation caused by a record downpour killed more than 200 people in the nation’s worst weather disaster in 36 years. Communities that grappled with rising floodwaters last week now find themselves battling scorching summer temperatures well above 30 degrees, as foul-smelling garbage piles up in mud-splattered streets. “We need the water supply back,” said Hiroshi Oka, 40, an Okayama resident helping to clean up the Mabicho district in Kurashiki where more than 200,000 households have gone without water for a week. “What we are getting is a thin stream of water, and we can’t flush toilets or wash our hands,” he added, standing over a 20-liter (4.4-gallon) plastic tank that stood only partly filled after almost four hours of filling. Water has been restored to some parts of the district, a city official said, but he did not know when normal operations would resume as engineers are still trying to locate the pipeline ruptures. The soaring temperatures have fueled concern that residents, many still in evacuation centers, may come down with heat-related maladies or other illnesses as hygiene deteriorates. 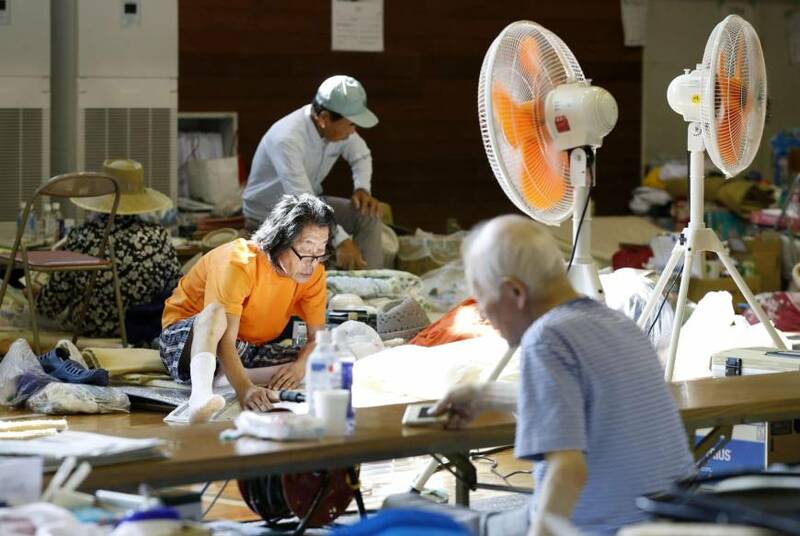 “I am worried my children may get heatstroke,” said Yoko Kitamura, 38, who took shelter at an evacuation center in Hiroshima with her four children. NHK is giving out advice on how to cope ﻿﻿with heat and hygiene problems, includingvideo tutorials on measures such as making a diaper from a towel and plastic shopping bag. 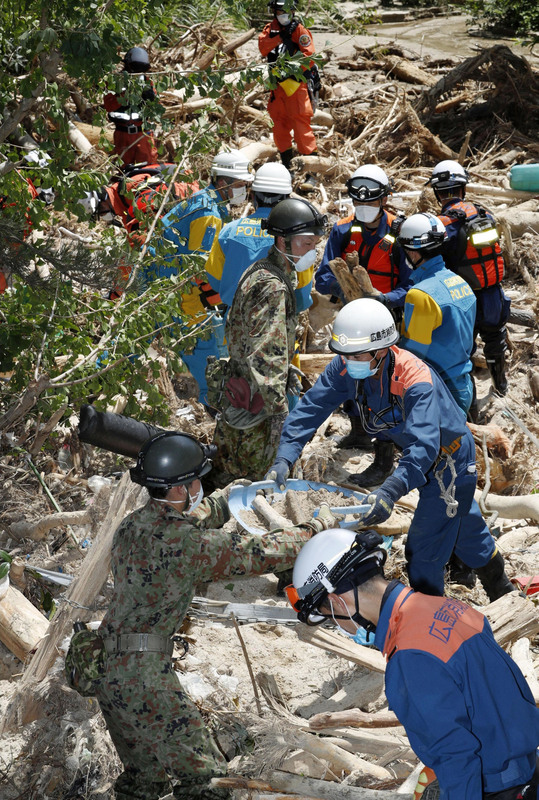 A week after the torrential rain began to pound western Japan, nearly 7,000 evacuees from floods and mudslides face heightened health and sanitation risks from the scorching heat and problems with bathrooms. A shortage of temporary toilets at evacuation centers, and efforts to refrain from eating and drinking to avoid bathroom use, are putting people at increased risk of dehydration and blood clots, experts say. Evacuation centers tend to have only a limited number of temporary toilets and many are squat-style, which children and elderly people often have trouble using. In past disasters such toilets have been a source of concern, with many children only accustomed to Western-style toilets. At an evacuation center in Uwajima, Ehime Prefecture, Michiko Wakisaka, 69, whose home was hit by a landslide, said she moved out of another evacuation center after finding it only had squat-style toilets she cannot use due to disabilities. “Everything remains uncertain,” she said. Another discouraging factor for using such toilet facilities can be their location. Many are set up outside, which tends to make people avoid using them at night or during rain. “It is a problem that is directly linked to people’s health,” said Atsushi Kato, who heads Japan Toilet Labo, a Tokyo-based nonprofit group conducting lavatory research. He said evacuees should have a role in setting rules for toilet use and suggested creating other options, such as putting portable toilets over existing toilets that are not functioning and allowing people use them at night. More than 70,000 Self-Defense Force troops, police and firefighters have fanned out to tackle the aftermath of the floods. 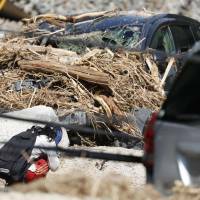 There have been 203 deaths, the government said, with dozens still missing. 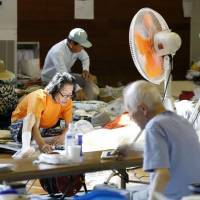 Chief Cabinet Secretary Yoshihide Suga, the government spokesman, urged people in flood-hit areas to take precautions against the heat and thunderstorms. “People still need to be aware of the possibility of further landslides,” he said at a regular news conference Friday. 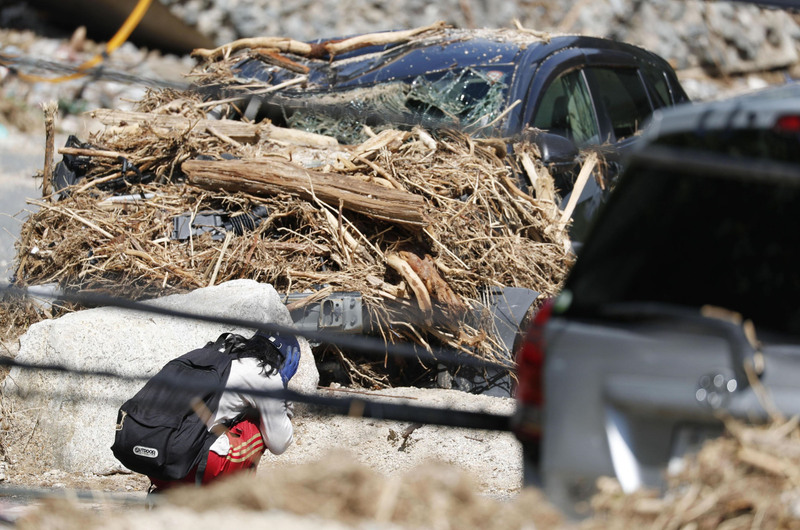 More severe weather has battered Japan in recent years, including similar floods last year that killed dozens of people, raising questions about the lack of flood-preparation measures and the impact of climate change. The financial cost of the disaster is still being calculated, but the agriculture ministry said Friday it has assessed losses of at least $207 million. That figure is likely to rise further as the cleanup continues and the scale of the damage becomes clear. It “could be the tip of the iceberg, as we are still unable to go and inspect fields,” ministry official Yasuhisa Hamanaka said. Agriculture Minister Ken Saito said the cost of some vegetables had already shot up by between 10 and 30 percent and that the ministry would be “closely monitoring” price hikes. To grasp the extent of the damage, Prime Minister Shinzo Abe visited Ehime Prefecture on Friday after a trip to Okayama on Wednesday. He offered silent prayers at the site and met residents affected by the disaster. Land, Infrastructure, Transport and Tourism Minister Keiichi Ishii will visit Hiroshima, Okayama and Ehime prefectures from Saturday through Monday.